1. In Project, choose Tools> Customize> Fields to open th~ Customize Fields dialog box ..
2. Use the option buttons to choose Task or Resource, then select the Type of field you want to customize from the drop-down list. 3. Select a field from the field list and click the Rename button. 5. Click OK to close the Customize Fields’ dialog box. Open the Visual Basic Editor, select the project you want to create the application in, and create a new Module. 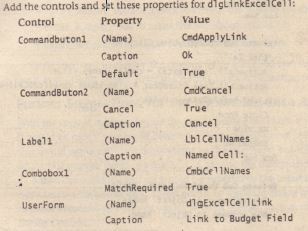 Name the module Excel_Budget. The following paragraphs describe the forms and procedures that handle the application requirements listed at the beginning of this section. The descriptions are followed by the code for the application. You can download this code, and a sample Excel workbook, from the Mastering Project 2000 page on the Sybex Web site but you’ll learn more about the objects used in this application if you create one or more of the procedures in the VB Editor. When an item is initially linked, the current value stored in Excel will be copied to the fixed cost. However, like linked fields in Word or Excel, the links in this application will not automatically be updated. Your application will need a method to refresh the links. This is.accomplished by the macro Excel_Budget Update_Links. We decided .that the individual macros for managing links would open Excel ;f it were not already opened, but would not close Excel. The user wouldn’t appreciate this application closing an Excel session they were using. The Object Variable that refers to Excel is placed in a standard module in the Global template. After Excel is opened, the reference will be held until project closes. Though Excel is opened invisibly, it is still loaded into memory. Once the user is done with Excel there is no . reason to continue using system resources to run it. Unlike many applications, Excel opens invisibly when it is called through automation. To open Excel so the user can edit the linked workbook, you merely have to make Excel visible. The macro Excel_Budget Show handles the settings to make the workbook visible to the user. 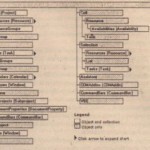 ‘String to hold error ~essage for Connection to Excel Error. ‘Input box Returns” if user clicks .cancel. ‘Summary tasks-this just ignores these errors. If objPropLocation Is Nothing Then ..